Facebook CEO Mark Zuckerberg announced a far-reaching music integration at his company’s f8 developer conference in San Francisco Thursday that will enable Facebook users to share music with their friends and listen to songs together in real time. Facebook has teamed up with Spotify, Turntable.fm, Vevo, MOG and close to a dozen other music startups to enable this new kind of music sharing. Users can also explicitly recommend songs to each other, a feature that Zuckerberg called “one of the coolest parts of the whole product.” And summaries of one’s music activity will show up in the newly launched Facebook timeline, highlighting which artists and songs are a user’s favorites. 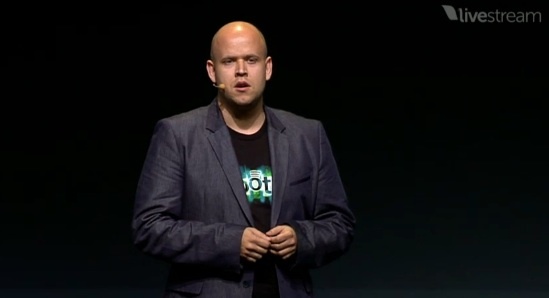 Zuckerberg was joined on stage by Spotify CEO Daniel Ek, who said that music was the missing link for Facebook. Ek compared the new type of music sharing on Facebook to the way people were sharing music on Napster some 10 years ago, but said that the music industry now was finally ready to embrace this kind of sharing. 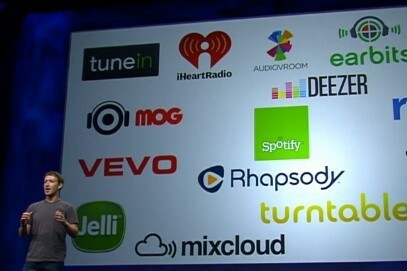 Some of the other partners include MOG, Rhapsody, Turntable.fm, Deezer, Soundcloud, Vevo, Songza and Tunein. 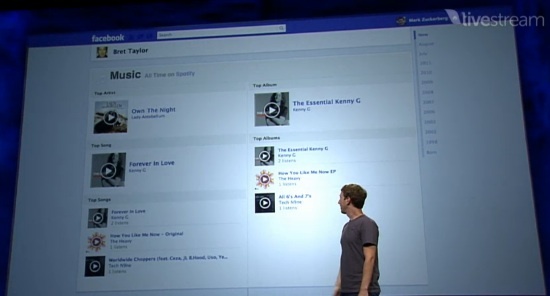 “I’m really excited what this next wave of music companies is doing with the open graph,” said Zuckerberg. News about the “Listen to your friend feature” leaked Wednesday when a Facebook employee tweeted about it. Peter Kafka reported earlier this week that Facebook originally planed to let users play music without ever leaving its site, but that those plans were scaled back at the last minute. Zuckerberg didn’t elaborate on this issue on Thursday, but it’s likely Facebook didn’t want to ruffle feathers with music publishers or other rights holders who would have wanted the company to pay royalties if it had been performing music on its site. I love that TuneIn is a part of this. They replaced FM for me a while ago and I couldn’t be happier with the massive amount of stations it provides. Hope their collaboration with Facebook really brings them a lot more exposure.